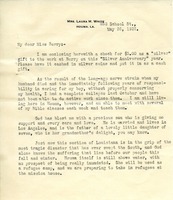 A letter to Martha Berry from Laura M. White about a donation for the Silver anniversary of the Berry Schools. White goes on to talk about her recent misfortunes and how God has helped her make it through these hard times. She also expresses her wishes to visit the Berry Schools. 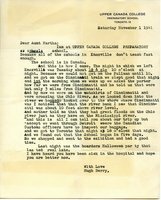 A letter from Hugh Berry (nephew) to his Aunt Martha Berry describing his journey to his present school, the Upper Canada College Preparatory School. He also expresses his sympathies regarding Martha Berry's hospital stay.